Submitted by Migrate Wizard on 2014-07-05 07:56. Alright folks, since the day I learned to grill a steak I decided to throw a barbecue party in my large garden. All sort of people showed up, since it was for free, but overall it still was good fun. I enjoyed grilling new steaks for everybody and didn't even mind when they took them home to feed their families instead of inviting them over to the party. But at one point some started to tell me it was -their- party, and that I should be grateful they came to grab and eat anything they wanted, as that allowed me to grill more steaks. Quite a few even started to pee in my garden. A wise person needs to understand when the party must be over, and I realized that this was in fact -my- garden, -my- barbecue and -my- steaks. I thought I was sharing them with friends, but the majority visited just because they were hungry and expected me to -serve- them for free as cook and waiter. I won't be throwing any more barbecue parties for this town. I was organizing a bigger and much better one, but I don't like ill-mannered guests around, so from now on, I'll only have private dinners with friends. I'll keep maintaining this thread and package for everybody to download, but there won't be further developments. I am also disabling votes and comments, at least for now, since I won't be checking this thread as often as I used to do. If you need to contact me you can use paulokrantz[dot]dev[at]googlemail[dot]com, or simply use the vault form to send me an email. Just click on my username. 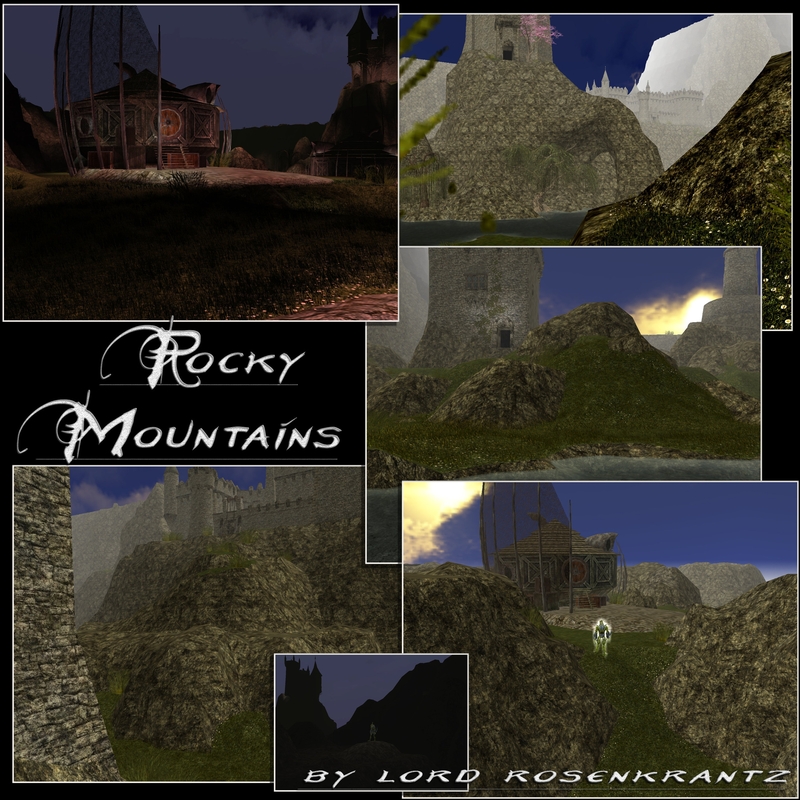 Sadly the v12 of the rocky mountains is not included in this release yet, as it still needs further work. In the meanwhile though the sudden release of the final game patch caught many with their pants down, including me, and I then thought it could be a good idea to upgrade these tilesets to be fully compatible with the patch. simplified the hakpack system, reducing the number of haks it is broken into. Using one tileset now requires 3 haks, all four tilesets requires 5 haks. The top hakpack can obviously replaced with your own specific to your module. included native support for a number of other authors tilesets on top of the CTP ones. The list currently includes Tom_Banjo's Forest, Barbaric North by Chandigar & s030363l, Michael DarkAngel's City Bridge, Maxam's Classic Dungeon, and a few other tilesets under development. The compatibility list will be updated as I receive the required data from the authors. If you are using any of the listed tilesets, you can safely place pk_top above the other haks. All doors and area settings are already merged for you. fixed an issue with 2 doors being misplaced above the doorway node. Thanks to Cuprius for reporting it. All tilesets must be considered WIPs (works-in-progress), although any publicly released version you find here is stable, and all possible future releases will always be backward compatible. If I update a tileset, the new version won't break any area you might have already built. All tilesets that you find here have been run through the wonderful CleanModels 3.0 by OldMansBeard, which is the best tool that a tileset creator can use to achieve high quality standards. Drop by its page and praise the author, he really deserves it. Tilesets include all model files in binary format, and all textures in DDS format, except those few that the game engine needs to find in TGA format. Providing the material already compiled allows for faster loading times, and generally better performance on our system. Some very outdated graphic cards could have difficulties using DDS textures, although I've honestly never seen anybody reporting such issues. In any case, if you have an old system and can't load the tilesets properly, drop a line here and I'll provide you tileset versions that would fit your particular needs. More in general, I considered that since the day of NWN1 first release, the average hardware in our machine has definitely improved, to the point that we now have more freedom than in the past when it comes down to texture quality and models complexity. It doesn't necessarily mean that these tilesets are resource intensive, it simply means that I cannot guarantee that very low end systems will run them smoothly, as such option was not part of my goals when building the tilesets. No tilesets use the shiny water effect, it is not a bug. I personally hate it as it looks really unnatural, and overrides the water color and details. I was/will then able to include specific water effects for each environment, example a very dark and immobile waterline for the swamps. Some tilesets might use a simple blank minimap for their tiles. It is not a bug, but a designer choice. The purpose is to increase the realism and immersivity of the areas built with such a system. No tiles use any tilefade feature (the "hide second story tiles" option in your NWN game settings). It is not a bug, but a designer choice. Again, to enhance realism and immersivity, hence a roleplay-oriented approach to the game. All screenshots are taken from areas that only use tileset resources, and never use any additional resources like placeables or similar. What you see is what you get. I have always loved the idea of non-flat terrains in NWN, but I wasn't too happy with the mountain tileset(s) created by the community. I was aware that making a new one would have meant a massive amount of work, due to the need of working around the game limitations, but eventually I decided it was worth all the effort to come, and I started. It is still my main project, and so it'll be for a long while. An "edge fixer" system that tries rather successfully to get rid of the "cake-layer" effect due to the way NWN places raised terrains. It has always been a major issue with any tileset, as all areas end up looking like a stepped pyramid every time one tries not to leave the terrain flat. With the appropriate and somewhat extreme tile design, and the use of a special crosser, I managed to almost avoid the issue at all, and now massive mountains can be built in a more natural way. The same edge fixer can be used to also enhance other terrains like the rocky hills and create more variations in the areas. A totally innovative lake/river terrain with attached mountain streams. It was built with a multi-layered technique that offers some rather good natural looking water effect, which although took some time to be set up, was well worth the effort in the end. Brand-new round "native" buildings. They were designed with the intent of providing an environment with a slight halfling/gnomish culture flavour. TNO castles. 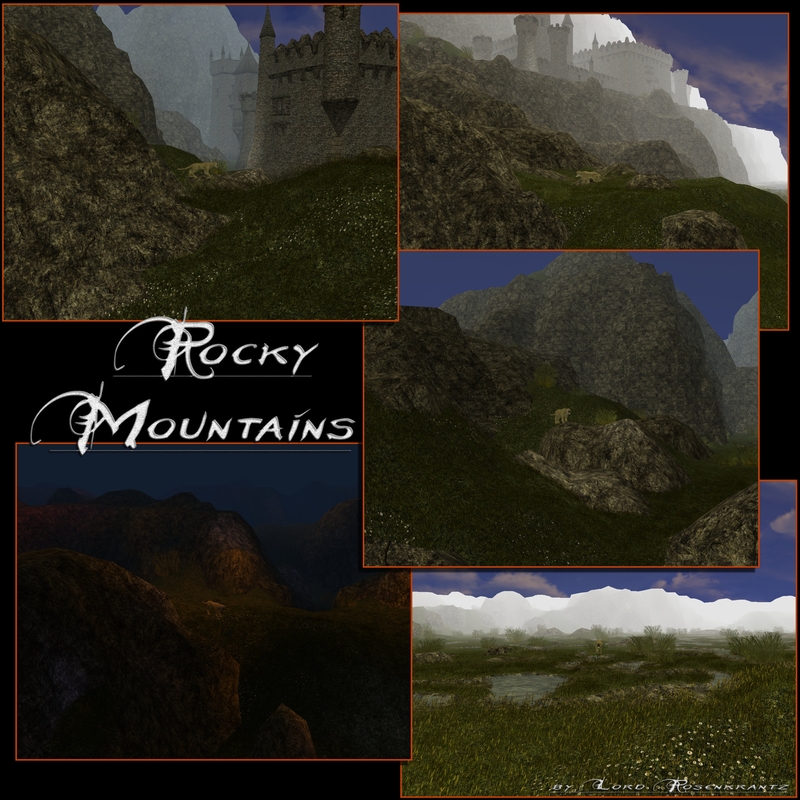 Originally I didn't plan to include them, but then both following community requests, and realizing on my own that they'd be a great match for a rocky mountains environment, I took the "rural" part of the castles, adjusted and smoothly merged them into my tiles, and the result was excellent. This tileset was published to hopefully provide the appropriate tool for the creation of a true, scary and beautiful swamp. 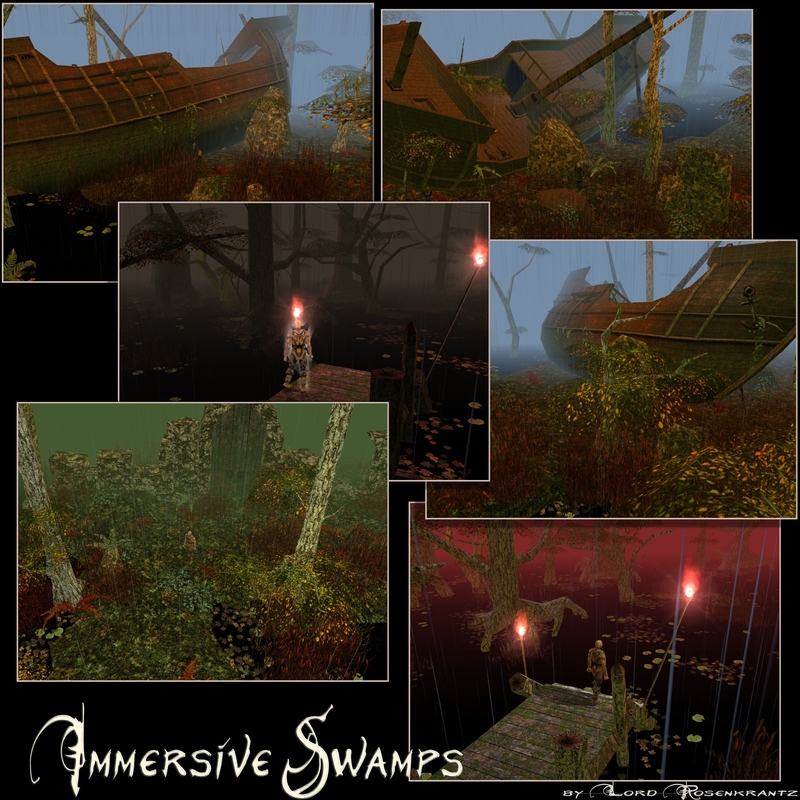 Although there are a few good swamp/marshes tilesets around, I always felt they didn't look "swampy" enough. As a step on the way of a proper swamp environment, I then released a small tileset that was a drastic reworking of some material due to Ilmater, CODI and Tupoun. At a later stage, I went again for a total reworking of it. New textures, new vegetation, new tiles and terrain combos. In the process, I used some material from the CEP compilation of placeables. It was reworked and adjusted to better fit the tileset, and included directly in the tiles. I also used some material from the Darkness over Daggerford hakpack. Specifically, the huts I used are a reworking of two placeable models included in that hakpack that I retexturized, slightly debugged (they are very well designed, from a technical point of view) and adapted to this tileset. Since I expanded the deep water (non-walkable) terrain to be used in combination with the dry/forest terrain, I created a small "development kit" hak that I advise to use to create and fully build the areas. The devkit hak must be placed above the main hak in the module hak list, and it facilitates the creation or walkable paths (or non-walkable deepwater areas) all the way through the swamps. It also automatically defaults the newly created areas to the approapriate values of music, sound, lighting and weather. They can still be changed in the area property tab, but this way they don't necessarily require to be manually set. Once the area has been built, the devkit can be removed safely from the hak list and the areas will gain their final appearance. This is my personal rework of a tileset released by Helvene and myself back in april 2006. 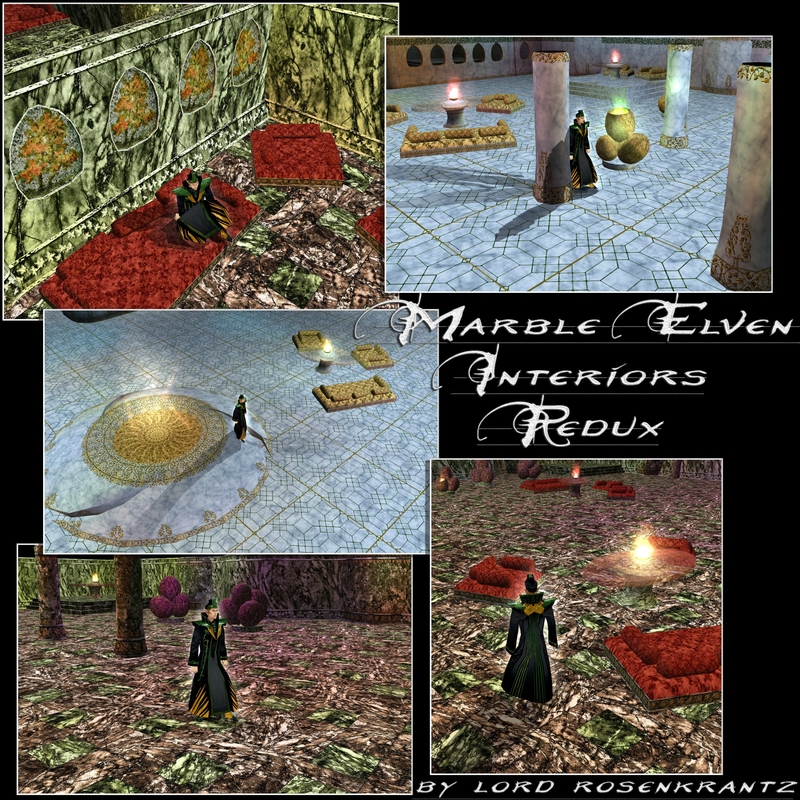 It was (and still is) intended to provide marble interiors with an elven flavour, although it would easily allow for different settings, given that no explicit elven elements were included. In this current version the tileset includes two different (but connectible) groups of terrain/crosser/features. It was originally based off bioware's geometry, reworked at the time of the first release, and further reworked by me for this version. I deleted and replaced with a more fitting style part of the geometry (fences, tables, columns etc). 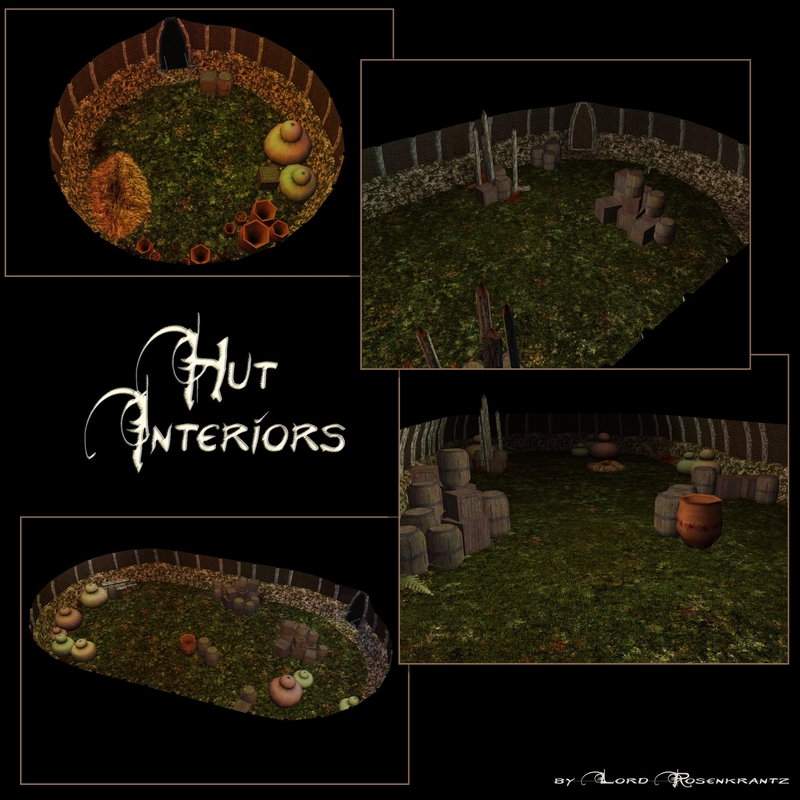 I created a new set of textures, the green themed ones, that are meant to offer an alternative to the beautiful blue texture set, mostly due to Helvene's creativity (I only added a couple myself, and did some minor tweaking) and that I simply couldn't leave out of this release. I have fixed literally hundreds of issues and details that were not satisfactory in the older version. I have also remapped basically every mesh and tile. It took a while, but was worth it, as I am rather content with the result. I don't plan to work on this tileset any further, except maybe adding one/two new features if I need a break from the mountains. 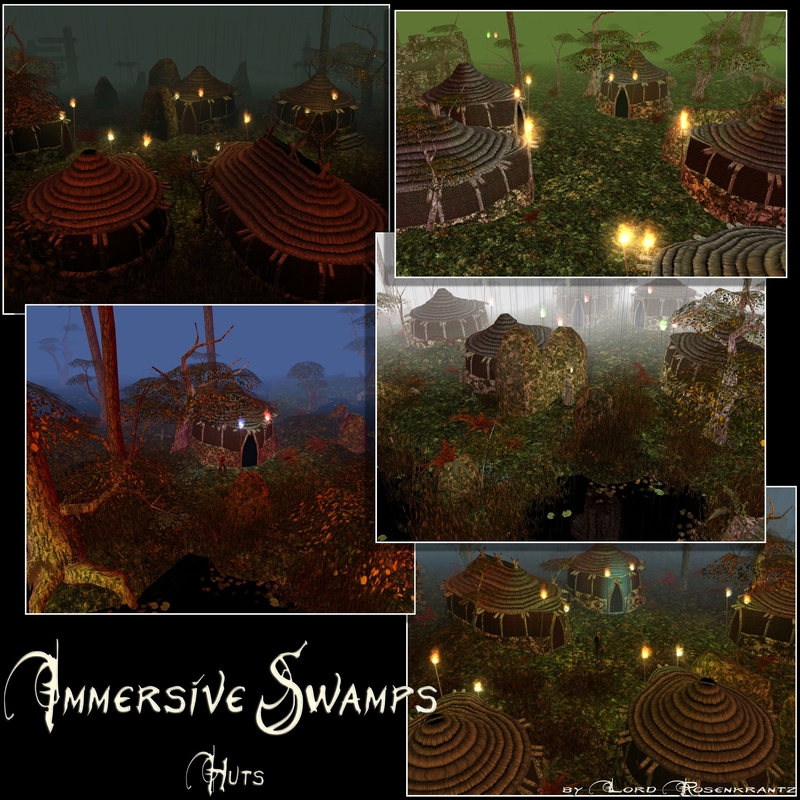 The Hut Interiors tileset completes the Immersive Swamps by creating an interior environment to match the huts included in the swamps, whether of lizardfolk culture or not. I started off planning to quickly adapt to my textures the small tileset released by Darkness over Daggerford team with their module. I ended up keeping a few elements from it, and remaking all the rest (including a different approach to doors placement). Instead of including a small bunch of pre-made hut interior combos, I decided to create them all as either terrains or crossers. It allows for a much wider range of options by combining any tile with any other tile of the appropriate type. This way there are dozens of variations to fit any specific needs. We had used the rocky mountains in our project, but had to remove it, because it was a hell of an fps killer. On some places it was hard to navigate, especially in the midst of a combat. But all looks great. This rocky mountains is still the best mountain tileset, but yes it does have WOK problems. Worth an edit for that.